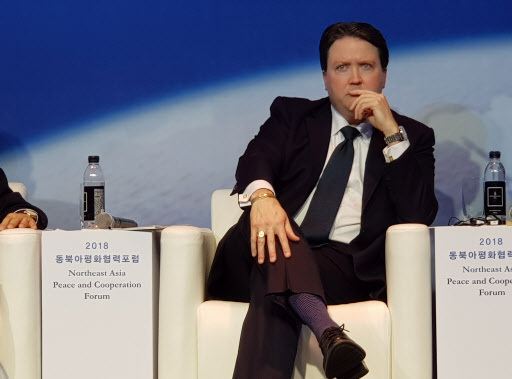 Marc Knapper, acting deputy assistant secretary at the US State Department, made the remarks during a forum on regional peace and cooperation in Seoul, as the Koreas eye a reconnection of inter-Korean railways. The US wants North Koreans to have a bright future provided by North Korean leaders “starting to make the right decisions” about the North’s nuclear and missile weapons program, he said. “To us, this bright future includes many different things ... it especially includes helping North Korea to integrate with the rest of the international community. Of course, part of this integration could include strengthening rail connection through the region,” he said. With the support of the US, South Korea received a sanctions exemption from the United Nations Security Council, allowing the South to bring fuel and other equipment into the North for a joint survey of inter-Korean railroads. The survey is to begin Friday, according to the Unification Ministry. The sanctions exemption only covers the field study, which means South Korea will have to seek further sanction exemptions to actually reconnect the railways and roads disconnected during the 1950-53 Korean War. The railway project, which the leaders of the two Koreas committed to at their April 27 summit, is key to laying the groundwork for South Korean President Moon Jae-in’s blueprint for inter-Korean economic cooperation. Moon pledged to create three cross-border economic belts -- one connecting the west coast of the peninsula to China, one connecting the east coast to Russia and one along the heavily fortified border. South Korea has been eager to expand inter-Korean projects with North Korea, which it believes could encourage North Korea to accelerate denuclearization, though many of them cannot proceed due to international sanctions against the North. Washington maintains sanctions will stay in place until the North’s complete denuclearization and has been worried about its ally South Korea moving too quickly with the North without progress on denuclearization. At the forum, however, experts said that the railway connection could help North Korea be more confident about taking bolder steps to denuclearization, and bring about stability in the region. Zheng Jiyong, director at the Center for Korean Studies at Fudan University, said that building roads and rail links in North Korea is a “reversible” measure and could give the reclusive country a “taste” of what the future might be like when it denuclearizes. North Korea has increasingly complained about the US’ unwillingness to ease sanctions against the reclusive regime. Shin Beom-shik, professor at Seoul National University, stressed the role of the US and Japan in joining the railway initiative connecting the Korean Peninsula and its neighboring countries -- China, Russia and Mongolia. “To make the project a success, the government should open the path for American companies to participate in the project in terms of financing,” he said, adding such connection of land and sea could mitigate conflicts in the region. “Railways foster confidence among countries because their existence mitigates threat perceptions, thereby promoting peace,” he said. 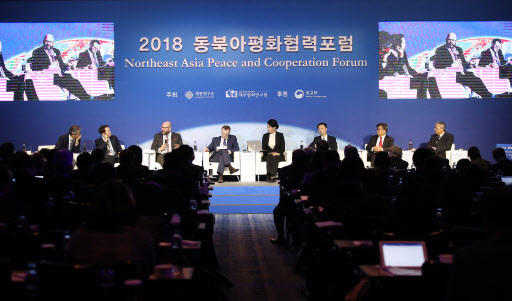 Hosted by the Sejong Institute and Jeju Peace Institute and sponsored by Seoul’s Foreign Ministry, the 1.5-track forum brought together government officials and experts from major countries including the US, China, Japan and Russia.